6:00 p.m. to 9.00 p.m. In the year 1944 the British took over the Naval base, now named H.M. Naval Base, from the Japanese. Thousands of Hindus from India came here to work. Inspired by his dream of Lord Murugan with a majestic golden cobra seated below a particular elanthamaran in the swampy mangrove area west of Canberra road, p. karupiah, a worker in the British royal navy dockyard constructed a very simple altar on the auspicious day of pongal in 1962. the tree under which the altar was constructed had six main branches which symbolized its link with Lord Murugan. he also placed pictures of other deities in the altar. Word spread of the small altar and the evening prayers, which were held daily. Hindus working at the dockyard soon flocked to the altar, which was walking distance away. Then commodore H M N dockyard designated the place to be designed as a place of worship. 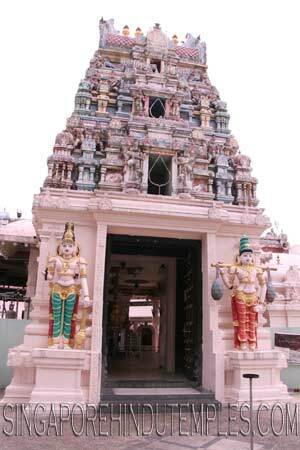 A small shed was built around the elanthamaran, and it became known as the Punithamaram(holy tree) Balasubramaniar temple. In 1964 the temple was officially registered. S. saravanan became the first honorary president and his elected committee were assigned with the project of building the temple. with great support of committee members and devotees the project was initiated. The building materials and other logistics were provided by the commodore of the royal navy and the superintendent of H M N dockyard.